Kimber, Lauren and Michael DiTallo opened High Finance Farm, offering lessons, boarding, training and showing. Gurnee, IL – December 1, 2015 – The DiTallo family is pleased to announce the opening of High Finance Farm, Inc. at the Fields and Fences Facility in Gurnee, IL. With Kimber DiTallo and daughter, Lauren, taking the helm as the head trainers, the new game in town offers riding lessons and training for all levels of riders in fun and educational environment. Kimber brings not only her numerous years (she doesn’t count any more!) of horse experience as horse owner, rider, manager, instructor and event organizer, but also over 19 years of corporate experience as a Manager in Skills Development Training. That experience gave her in-depth background in how to train people and she applies those skills daily. She is also a United States Hunter Jumper Association (USHJA) Certified Trainer and was the USHJA Zone 5 coordinator and National Host for the 2011 Emerging Athlete’s Program (EAP) National Finals. Lauren grew up riding and competing in the Chicago area and has been a professional in the industry for four years. 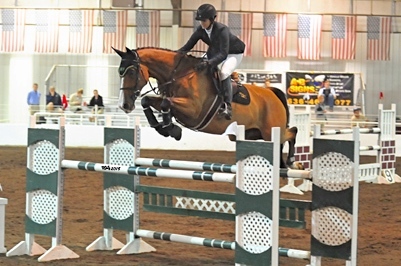 She was a National Top 12 Finalist in the USHJA EAP in 2009, 2010 and 2011. Through the EAP, she had the privilege of working with several different top professionals across the country including Julie Winkel, Mindy Bower and Melanie Smith-Taylor. After graduating from high school, Lauren moved to Reno to work as an intern for Winkel. There she gained further skills in riding, training, young horse development, show management and horsemanship. Lauren graduated from Julie Winkel's program after two years in 2013. Lauren has competed at the highest levels of the hunters and jumpers and has experience working with natural horsemanship, young horses, and problem horses. She currently competes with her jumper, Totally Wicked, in the 1.30M jumper divisions. After settling into the large lesson and show facility, the family bought out the riding school and lesson program. With the assistance of Stephanie Lucero, the farm offers a full-scale lesson program Tuesday through Sunday. Lucero comes with years of experience from pony club to eventing, enhancing her teaching skills to provide the best lesson curriculum for each rider’s ability. High Finance Farm is able to provide boarding, private lessons, riding school lessons, training, showing and sales. The farm plans to keep things hopping with a Thanksgiving Horsemanship Camp, a Holiday Camp, Summer Camps, schooling shows, A and AA horse show opportunities and clinics. The farm welcomes top clinician and course designer Linda Allen for a clinic January 23-24, 2016. 2 heated indoor riding arenas. Whether you own a horse or not, High Finance Farm can provide you with a complete equestrian experience that is both educational and fun. They are currently offering Gift Certificates for lessons, the perfect Holiday gift for the special equestrian in your life. Contact them today to see what they can do for you or to purchase your Holiday gift certificate.